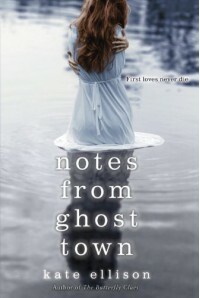 Read the full review on my blog, in both English and Romanian.http://vanillamoonblog.com/2013/02/09/rewiew-notesfromghosttown/I have been reading a lot lately, and this made me become stricter and more selective with my books. But every once in a while, I come across a book that enages and inspires me so much that it becomes one of my favourites of all time. This was the case with “Notes From Ghost Town” by Kate Ellison. For some reason, I find it harder to express my feelings about books that I absolutely loved. There are so many thoughts I have about this book, I hope I am coherent in these following lines.The book deals with a series of very delicate issues: mental illnesses, death, divorce, losing all that is dear to you. The protagonist herself feels like she’s losing it, especially because her mother’s mental illness is hereditary. The fact that she suddenly sees everything in black, white and shades of grey (literally) doesn’t help either. Or the fact that Stern appears in her life as a ghost, insisting that her mother wasn’t the one who killed him. You can see how complicated the whole situation is, and how Olivia copes with all this is trully remarkable. She keeps telling herself that she might be crazy like her mother, but exactly the fact that she is having these thoughts shows that she is actually not. I love characters who are in a constant fight with their thoughts and emotions!The action is slow-paced at the beggining, with a focus on the main character’s feelings and thoughts, and I must say I love this kind of books. It reminded me of the British classics written by female authors I love so much (like the Bronte sisters) with all those inspirational phrases. I don’t usually highlight very much on my Kindle, but for this book I have 8 Kindle pages of highlights, and not just simple senteces, but whole paragraphs or pages from the book.I have been so immersed in the book from the very first page that I found myself thinking about it during the time I was not reading it. “Oh Susannah” was playing in my head and I actually sang it out loud while I was dressing or brushing my hair, like Olivia heard it in her mind right before Stern’s ghost appeared. I find it so sad, losing your best friend before having the chance to tell him you actually loved him. That’s probably the most clear lesson this book teaches you: don’t leave any unspoken feelings and thoughts.“Notes from Ghost Town” managed to fully engage me in its story. The whole tension and mystery in the book envelopped me and I couldn’t help but read page after page. Time stopped and I felt like I was living everything that Olivia did. Her smile was mine, her sorrow was mine, her tears were mine… literally. I can’t remember when a book last made me feel like this.The author did great not only in creating this unique story, but also in portraying the characters and making even the idea of Stern’s ghost seem realistic. I particullarly liked the idea of the Gray Space, the place that Olivia’s schizophrenic mother describes as a place of anti-art, antifeeling.I recommend this book to readers in search of something new. It’s not a typical thriller, not a typical romance and certainly not a typical paranormal book. It’s a very unique combination of the three and if you are a fan of one of these genres, and also like books that focus on feelings, you are sure to love this book too.